Butternut squash is on almost everyone’s Thanksgiving Day menu. It’s great as a side dish or made into a soup. 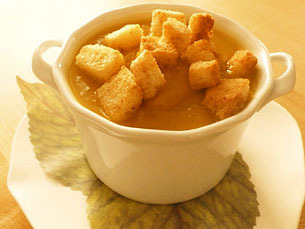 I’ve just completed a video on how to make Butternut Squash Soup which I know you are going to love! It can make it two days in advance and just reheated on Thanksgiving Day. Butternut Squash is a hearty winter squash, and just like a pumpkin, it is a heavy, dense vegetable with seeds in the bulb part at the bottom. Surprising, butternut squash works well with a variety of flavors including cinnamon, maple syrup, curry, ginger, coconut and even granny smith apples. Just don’t try adding all of them at the same time! You might want to consider wearing disposable glove when you’re preparing butternut squash as it will stain your hands orange. Do be extra careful when you are puréeing hot soup in the blender. Not only do you need to do it in several small batches but also be sure to open the plug slightly in the cover of the blender to release the steam!! I’ve been on a cooking kick lately, and unfortunately I was so busy this winter that I wasn’t able to make much soup. Today I whipped up your Butternut Squash Soup (as per your video), but also threw in 1 Delicious apple for extra sweetness. Since I’m serving it for dinner tonight, I just gave it a litle taste (okay, okay, I couldn’t help myself and had a small cup! ), and it was DIVINE! I made a double sized batch so that I can freeze one half in a freezer container and I can make the rest in a few weeks when I get the hankering for more! Having never made butternut squash soup before, I always thought it had some kind of cream in it since it is so thick, but I was surprised to find that it is really nothing more than the veggies and the chicken or vegetable broth. So, not only does it make it tasty, but it also makes it healthy. Two great positives–especially since I’ve just really started a new eat healthier and excercise diet so I can lose 10 pounds. Thanks for another great recipe! I’m making one of the casseroles tomorrow, so I’ll make sure to write on how that one goes. Keep the great recipes coming, Kathy! Thanks Lisa! Yes this soup freezes beautifully – and it really does taste so rich and creamy you do think it must have cream in it! Never made soup so thought we’d give this a try before Thanksgiving – This was so easy to make and delicious!!! Will definitely be on the menu for the holidays. Love the video – it was very helpful. You’re right, this is an ideal recipe for Thanksgiving. I hope you check out my other videos as well!